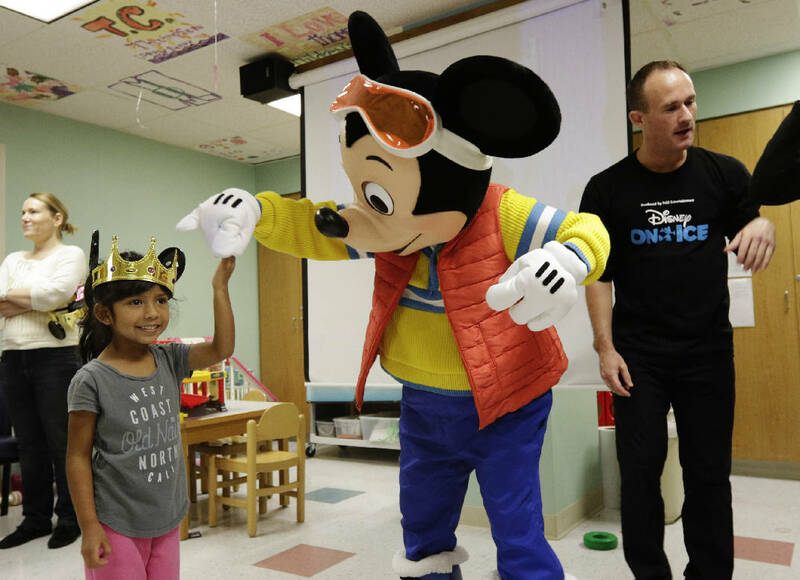 Mickey Mouse twirls Leslie Martinez, left, as figure skater Mathew King stands nearby during a visit by Disney on Ice to Erlanger Children's Hospital on Wednesday, Nov. 8, 2017, in Chattanooga, Tenn. Mickey and two figure skaters met with children to help make their stays in the hospital a little easier. When 3-year-old Maya Oliver walked into the Children's Hospital at Erlanger playroom Wednesday morning wearing a pair of Minnie Mouse ears, it was hard to tell she underwent a blood transfusion just the day before. She was smiling, hugging and giving out high-fives to her other favorite Disney character, Mickey Mouse, who stopped by for a visit as part of the "Disney on Ice: Frozen" tour, which begins this week. "Anything to make her smile and be happy is exciting," said Maya's mother, Frances Oliver. "It doesn't have to be gloom and doom when you're in the hospital — she thinks it's a big party." The hospital can be a difficult place for kids, so integrating fun and normalcy into the experience is crucial, said Nicole Tetzlaff, a child life specialist at Erlanger. Julie Pritchard will be skating this week as a citizen of Arendelle beside “Frozen” characters Anna and Elsa. Showtimes are Nov. 9 at 7 p.m.; Nov. 10 at 7 p.m.; Nov. 11 at 11 a.m., 3 p.m. and 7 p.m.; Nov. 12 at 1 p.m. and 5 p.m. at the McKenzie Arena at the University of Tennessee at Chattanooga. "To be able to bring something so special and something so familiar like Mickey Mouse to a place that can be so scary is just awesome," she said, adding that it lifts the staff's spirits, too. "I love being able to see the kids' reactions and, obviously, the smiles on their faces." Tetzlaff's job entails brightening kids' days with stuff like Disney characters, but there's also a large education component of explaining medical procedures in ways children can understand, such as explaining that an IV is "a little straw for our body." "Kids play when they're healthy, and they play when they're sick, as well, so it's important that we continue to support them through that," she said. Frances Oliver echoed Tetzlaff's sentiment that children need familiarity, especially in the midst of hospital chaos. "We've lived in the hospital for the past few years, so this is kind of the norm for us, unfortunately," Oliver said. "We still try to have a bedtime routine and brush our teeth, read a book and do some normal things." Julie Pritchard was one of the ice skaters who visited the hospital Wednesday. Pritchard, of Chester, England, has toured with "Disney on Ice" for 10 years and visited several hospitals along the way. "It's like one of my favorite things to do — just seeing the children — they come to life," she said. "When they're going through all this, and then you bring Mickey in, their faces light up." Pritchard began skating when she was 6 years old and said she's always been drawn to perform. "It's a way you can express yourself while you're on the ice," she said. "When you're competing, it's for the judges. But when you're performing out there, it's for the audience and the audience's enjoyment."